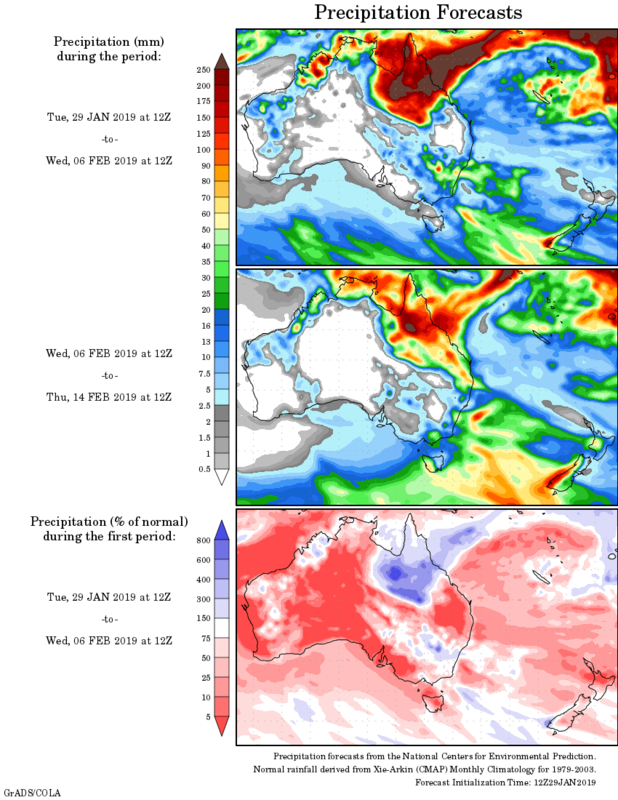 The monsoon trough enhanced convective activity over the northern tropics during the week, with heavy falls recorded on Queensland’s north tropical coast. Tropical cyclone Riley developed off the Kimberley coast in Western Australia and brought moderate falls to the Pilbara. Past seven days: At the start of the week, the monsoon trough stretched across the northern tropics and enhanced convective activity over the Kimberley in Western Australia, the Top End in the Northern Territory and the tip of the Cape York Peninsula and north tropical coast of Queensland. Elsewhere, the country was largely dominated by a broad area of low pressure, with isolated thunderstorms and moderate falls over parts of eastern New South Wales. In the west, a low pressure system produced thunderstorms with moderate falls in far southwest Western Australia, while an active inland trough triggered an extensive cloudband over central to eastern parts of the State that brought isolated moderate falls. Isolated thunderstorms also developed in parts of central Australia. Two tropical lows identified along the monsoon trough – one off the west coast of the Cape York Peninsula, and the other north of the Kimberley – intensified, with the latter developing into tropical cyclone Riley on the 24th northwest of Broome in the west Kimberley. Moderate falls associated with Riley were recorded in the Pilbara in Western Australia as the system tracked parallel to the coast. From the middle of the week, the monsoon trough shifted further south, and the lingering tropical low over the Gulf of Carpentaria moved across the Cape York Peninsula. Moderate to heavy falls were recorded over the Cape York Peninsula and the north tropical coast of Queensland, as well as in the Top End in the Northern Territory and in parts of the Kimberley and Pilbara in Western Australia. A broad low pressure trough and associated cloudband stretched from the northwest to southeast of the country to a low south of Tasmania, with mainly light rainfall totals recorded from central to southeastern Australia. An outer cloudband from Riley produced moderate falls in the Pilbara and Kimberley. Moderate to heavy falls continued in Queensland’s north tropical coast, extending to the northern interior, Gulf Country and Cape York Peninsula as the tropical low lingered around the base of the Cape York Peninsula. Thunderstorms developed over parts of the Tablelands in New South Wales, generating isolated moderate falls. Rainfall totals in excess of 400 mm were recorded from about Cooktown to Ingham, and around Bowen in Queensland, including the highest weekly total of 766 mm at Whyanbeel Valley in north Queensland. Rainfall totals in excess of 200 mm were recorded in the Darwin–Daly district in the Northern Territory, the north Kimberley coast in Western Australia, parts of the northern Cape York Peninsula, and along the northeast coast of Queensland. Rainfall totals exceeding 100 mm were recorded around Broome and the northern Kimberley in Western Australia, parts of the northwest and northeast of the Top End in the Northern Territory, an area of the Gulf Country, and large parts of the Cape York Peninsula and Queensland’s east coast south to Mackay. Rainfall totals between 50 mm and 100 mm were recorded in parts of the Pilbara and Kimberley in Western Australia; much of the Top End in the Northern Territory; and area of the Gulf Country; much of the Cape York Peninsula, northern interior and north tropical to central coasts of Queensland. Rainfall totals between 10 mm and 50 mm were recorded in the southwest, central interior and remaining parts of the Pilbara and Kimberley in Western Australia; in areas of the west and most of the northern half of the Northern Territory; most of remaining areas of northern Queensland, in parts of northwestern and eastern New South Wales; in isolated areas of the north and east of South Australia, and an area in western Tasmania. Little or no rainfall was recorded in remaining areas of Western Australia; most of the southern half of the Northern Territory; in parts of southern, western and northeastern South Australia; most of western New South Wales; the western half of Victoria, and central to eastern Tasmania.